It wouldn’t be summer without distressed denim shorts being an integral part of your wardrobe – in my opinion at least. A pair of perfectly worn, comfy denim shorts is one of the easiest ways to throw together an outfit when it’s nearing 90 degrees outside and you want to be cool and still look cute. They work as a bathing suit coverup for the beach, they’re great with your favorite t-shirt, and they’re totally acceptable for any kind of BBQ or backyard function. 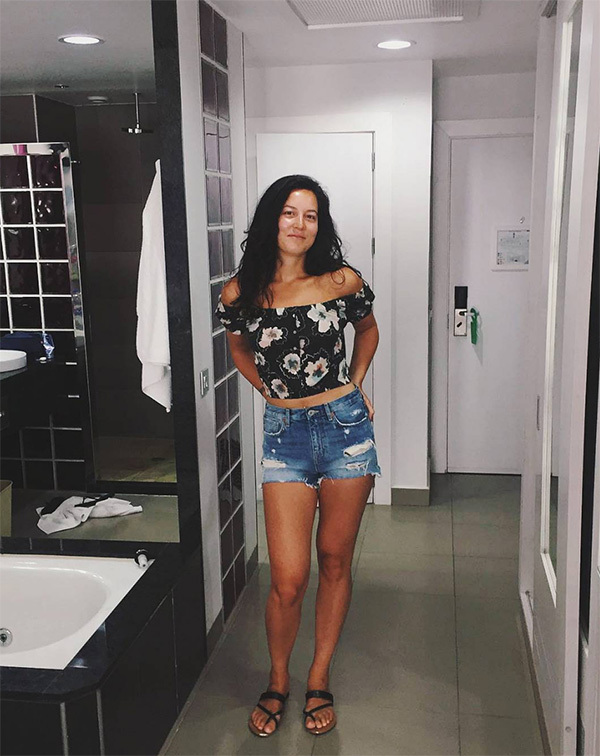 But denim shorts, especially distressed ones (featuring ~cute~ rips, tears, or even paint splattered) are definitely more casual than anything else, and so sometimes, they can come off as a bit… well… sloppy. 1. Add a trendy, chic top that will instantly pull things together – one great option is an off-the-shoulder top. Sneakers keep the look casual, while added accessories like a structured handbag make it more stylish. 2. Make your shorts look more tailored by tucking your shirt in and adding a simple leather belt. A button-down is ideal for this look, and cute shoes, like ankle booties. 3. Keep your outfit simple but chic with classic pieces like a striped shirt, a cute summer hat, and bright sandals. It’s still comfortable without looking sloppy. 4. Even a crop top paired with ripped shorts can look stylish instead of messy! Pick a crop top in a pretty pattern. Cute flat sandals make this casual look work. 5. 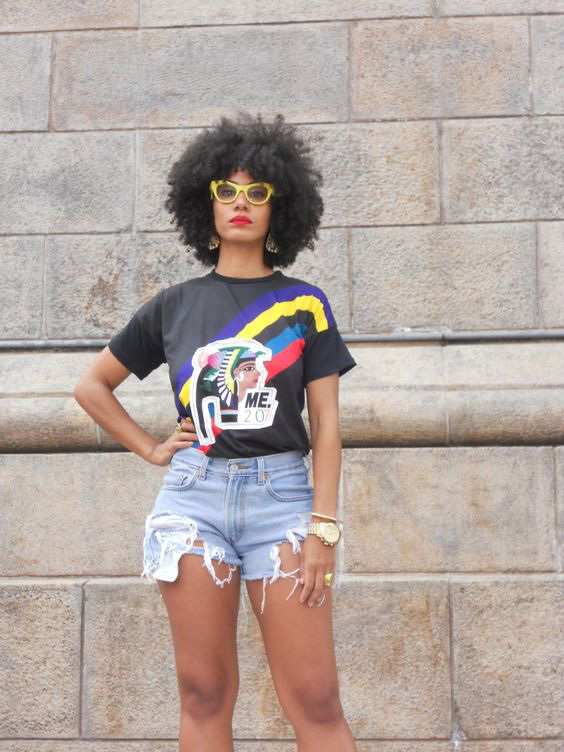 Denim shorts can paired with a graphic tee, but not when you do it like this. Pick a bold tee, tuck it in. Add accessories like gold jewelry, funky glasses, bright lipstick. 6. 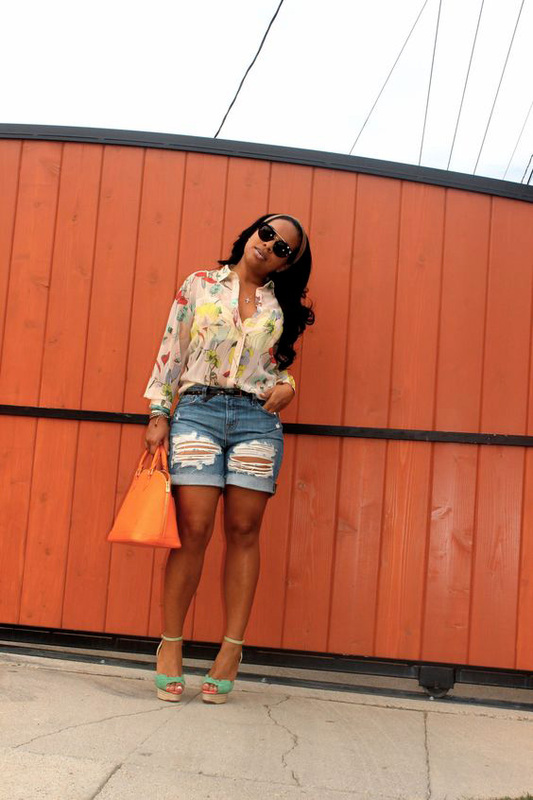 A crisp white blouse is one of the easiest ways to dress up distressed denim shorts. Tuck it in, pair with classic heels, and add a pretty clutch. 7. Work some layering action to make a crop top and denim shorts look like an outfit straight out of a fashion magazine. A long tailored vest is perfect for this, and strappy heels. 8. The right accessories have the power to make any outfit more chic, even if it’s just a plain tank and ripped shorts. Fringe sandals and lots of gold jewelry work like a charm. 9. Go for something casual that’s still very cute by adding trendy items like cool sneakers and a baseball hat. 10. If your shorts are frayed on the bottom, cuff them up to change ’em up a bit. A fun patterned blazer over a graphic tee is unexpected, especially with the heels. 11. Layered looks are what you want in distressed denim shorts. A crisp white shirt with a fitted blazer really makes your shorts professional. Ankle boots keep this more casual. 12. A hat and cool ankle boots are all you need to take your white tee and denim shorts to the next stylish level. 13. This outfit couldn’t be easier or more comfortable. The key to keep it from looking sloppy is to add a fitted cardigan and a leather belt, and to front tuck the tee. 14. Another super simple way to make your shorts more put together – a slim sweater, strappy sandals, and lots of gold necklaces. 15. Add lots of bright colors for a very summery feel – a printed blouse, colorful sandals, and a bright bag are perfect. 16. The power of accessories! Lots of delicate gold jewelry and a chic clutch make anything look more fancy. 17. If the weather is on the chillier side, a long sweater can make even a baggy tee and high-waisted shorts look good. 18. Unexpected mixed prints, like this shirt and clutch, are enough to make any outfit look good. 19. Add a fitted black blazer for an instant style update. I love this tailored piece with the old Converse sneakers. 20. Add a layer in the form of an easy plaid shirt left open. So simple, so casual, so cute.